An agent-based model simulating accent formation dynamics, inspired by the research of William Labov. Each town in the model has an accent based on where in the mouth each vowel is sounded – just like real people. Those positions are influenced by neighbouring towns, and regional accents emerge and change in response to each other. Just like real life? This is an agent-based model I created for my agent-based modeling class. It was inspired by an NPR interview with William Labov. He described American accents as sometimes entrenching and generally changing, which seems to run contrary to expectations in an increasingly media- and tech-connected world. The pattern of change he described–constant novelty falling shy of complete randomness–sounded like the kind of lava-lamp behaviour we often try to imitate with our agent-based, emergent models of the world in complexity-land. So I decided to make a model of accent formation. I used the NetLogo agent-based modeling environment. To run the code version, install a copy of NetLogo 4.0.2 on your computer, run it and open the tafmo-dec5.nlogo file you downloaded from the above link. An earlier version of the mode, which the analysis in the paper was based on. 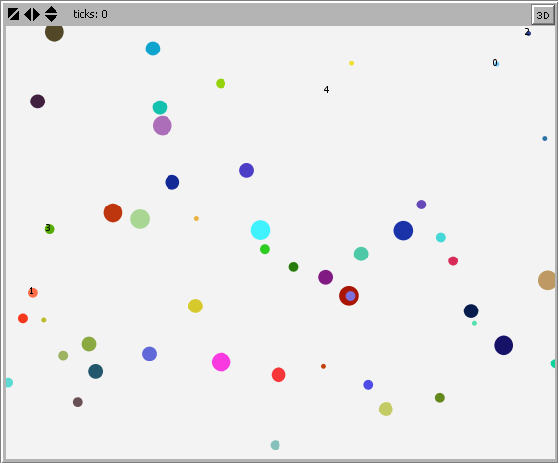 This does not include the Moran’s I clustering measure. The above paper was submitted with the model. It describes the model mechanisms and some quantitative experiments which were conducted to characterize it’s behaviour. The paper follows the ODD protocol for describing individual-based models. Some extracts from the paper are below. The Town-based Accent Formation Model (TAFMo) simulates some hypothesized mechanisms of regional accent formation and change. The model is an agent-based computer simulation. The agents of the model are towns with explicit locations and population sizes. Each town’s accent is determined by the position in the mouth at which each vowel (a e i o and u) is sounded by that town. Vowel positions are free to change in response to two influences: 1) vowel positions are “pushed” apart from each other in the mouth, to simulate the tendency towards distinguishing between words with similar consonants, and 2) vowel positions are “pulled” towards the vowel positions of other towns, to simulate the tendency for interacting populations to mimic each others’ accents. Town’s vowel positions are more strongly influenced by the vowel positions of closer and larger towns. The goal of the model is to simulate and hence attempt to explain generally observed spatial patterns of accent formation and change. Experiments indicate that the model is capable of generating spatially autocorrelated distributions of vowel positions, which are the model analog of regional accents. The dynamics of accent formation are strongly hypothesized, both in terms of the specific mechanisms of sound-pronunciation within speakers’ mouths, and the patterns of change of the spatial distribution of the resulting accents. Considerable spatially-explicit data has been collected regarding the distributions of accents in the real world, and considerably more aggregate and narrative sources of historical data of accent distribution exist in the literature . One method to explore and test the plausibility of these theories would be to encode their low-level assertions into a computer simulation model, and see if that model could emergently generate the high-level observed patterns. This approach could have the additional benefit of being a conceptual link between the regional-spatial and in-mouth theories of accent formation. The model described here is an attempt to implement these ideas. This model belongs to a class of computer simulation models which are composed of a series of independent entities which react to their environment and adapt independently of each other. These agent-based models are used to simulate and explore the putative behavior of systems which are thought to be “complex”: those whose system-level behavior is not the result of system-level controls or constraints but rather the emergent result of the behavior of the many agents of which they are made. Among other characteristics, complex systems often display constantly novel behavior, rather than settling to stasis at some equilibrium. Given that regional accents also seem to be characterized by constant novelty, it seems likely that they are an emergent complex system. The method of description used for this model follows the “Overview, Design concepts, Details” (ODD) format proposed by as a standardized layout for the description of agent-based models. Some experiments testing the model’s capacity to generate simulated regional accents are then described. Lacking the extensions described in above, the model is not yet in a form robust enough to conduct more sensitive experiments regarding subtler regional accent phenomenon. Observation of individual runs provides some anecdotal support for the possibility of the emergent simulation of such phenomenon as triggering events and size-hierarchical transmission . Due to the looseness of the scales of the model it is difficult to interpret if such anecdotal observations may be driven by mechanisms analogous with real-world events or not. More empirical parametrization and initialization would increase the value of observation of such phenomenon. Better metrics would improve our chances of identifying them. Some tentative conclusions may be drawn from the model as it is currently implemented. Spatial autocorrelation of vowel positions does routinely occur over a wide range of parameters. Indeed, positive spatial autocorrelation values are more common than negative ones over the full range of parameters tested (see Figure for example). The model does generate regionalized order to some extent. The strength of that order does not appear particularly robust. Perhaps this would be improved with more empirical initialization of town size and location distribution. Perhaps not. See Figure . Intermediate rather than extreme values of parameters often generate the highest degree of spatial autocorrelation (Figures and ). This suggests that interactions between individuals may be complex in interesting ways. A central necessity to increasing the formation of regional accents in the model, is the use of non-linear distance response functions. Varying the strength of the pulls between towns has some impact on accent formation, but not to the degree that varying it’s character does. If the model does represent a real-world analog, then this may be the model’s first suggestive result. It is not enough that people have a limited response to the accents of other towns. That response must fall off disproportionately sharply as distances between towns increases. This could suggest, for instance, that interactions between individuals must be of a relatively personal character in order for accent to be transmitted. Scenarios. Barring the inclusion of actual data, tests could be run using imposed scenarios which represent caricatures of real-world accent situations. Is it possible that increasing connectivity (rise of telephones and broadcast media) might lead to more dynamics, instead of an averaging out to homogeneous equilibrium?